The best games are created within their own wonderful world. The worlds, of course, have maps to visualize the beauty of it all to the players. I don’t know what it is about maps, but I love them. The desktop background on my laptop is the map of Middle Earth from The Lord of the Rings. Maps are cool and I think they’re fun to look at as it shows all the depth and detail the creators put into making worlds we know and love today. This is a puzzle Kris and I put together last summer. I can’t remember how many pieces it was… maybe 1,000? It was a big one and not as hard as we thought it would be. I love puzzles, gluing them together, and framing them. Even though we did this puzzle last year, it’s still sitting in our closet. We have slanted walls in our office and bedroom, so we’re not quite sure where to put it yet. It’s bigger than the picture makes it look. I love collecting things. Once I have one of something, I feel the need to collect them all, even if it takes me the rest of my life (mostly because I’m cheap). 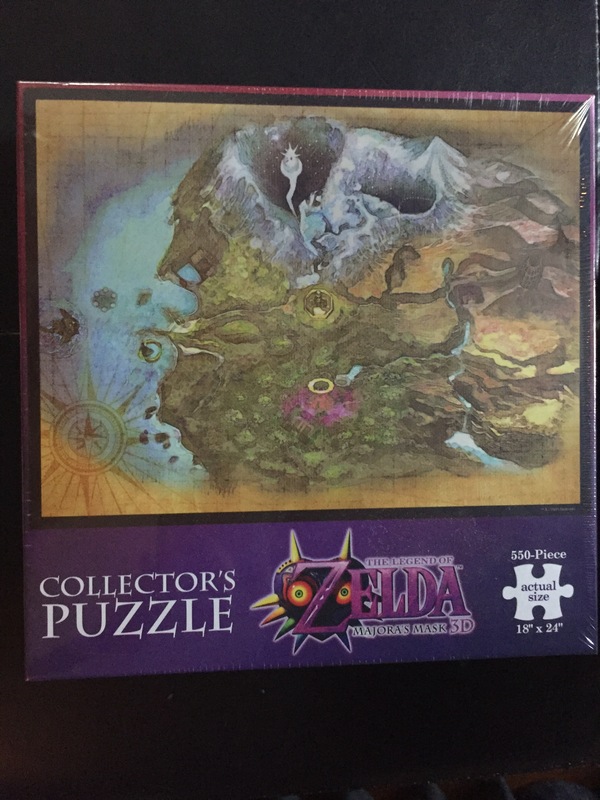 So when I found this puzzle at GameStop, I had to have it. Kris and I were there for a game or for the Pokemon 20 legendary of that month anyway, so we decided to get it. It’s the map from The Legend of Zelda: Majora’s Mask, if you weren’t able to tell. This puzzle is about 550 pieces, so it won’t be as big as the Hyrule map. Then again, it might be harder than the Hyrule map. Anyway, now that I have two maps from the Zelda world, I’ve been keeping an eye out for maps of the other games. I of course have to get Ocarina of Time, and I know Twilight Princess and Skyward Sword would be gorgeous. Of course, I think all of them are gorgeous. As Kris mentioned yesterday, we went to GameStop the other day to get the next legendary Pokemon for the 20th anniversary. Kris found a game she decided to buy and I of course found another puzzle. I should have known that maps for the Pokemon regions would exist! 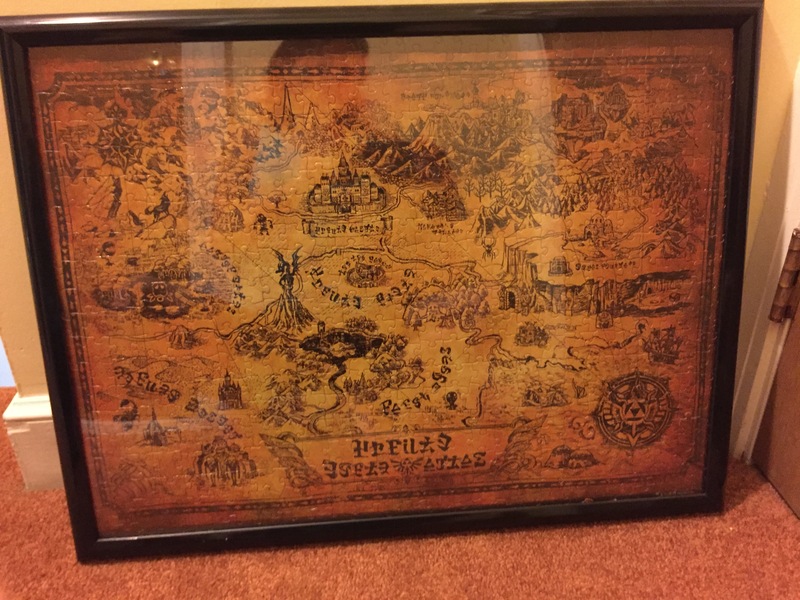 It’s obviously not Zelda, but now here’s another map series I need to collect. Kris bought it for me because she’s a nice older sister (I’m obligated to slip that one in there because she buys me things a lot). This puzzle is also 550 pieces and shouldn’t be too hard to put together. But you never know. Kris and I love working on puzzles. We usually marathon TV shows or a series of movies while doing them. Now we’ve added two more to the collection and there will be more to come. I mean, we’re definitely going to have to get the other Pokemon regions. I can’t just flaunt around the second generation and call it a day. No, there are five (almost six) more regions to collect. I hope I can buy a house with big walls. Do you love jigsaw puzzles? If so, do you put together puzzles from video games? 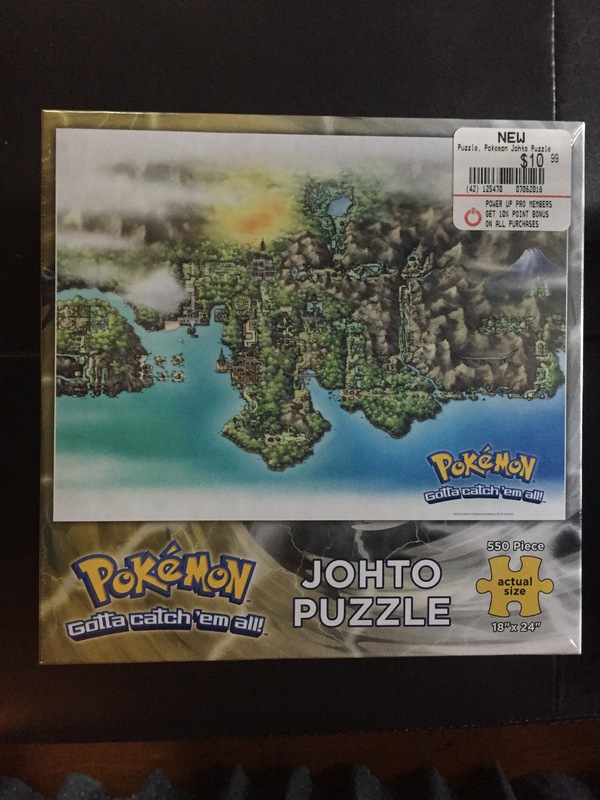 I saw that Johto puzzle the other day too! It’s awesome that you got it! I used to do some jigsaw puzzles when I was younger, but not so much now. They’re fun though, especially when they’re video game themed and you frame them like you did. I love puzzles. They’re such a relaxing activity. I hope I can find the other regions. Hopefully, they’ll release a new one for the Alola Region sometime! That’d be nice! It’d be cool to see it all together.